Diet Books: Fat On Profits, Skinny On Results? Diet books are perennials on best-seller lists, and every year a new one seems to capture the public's imagination. But the way to lose weight really always boils down to the same thing: Eat less and exercise more. So why do people shell out good money for diet books? 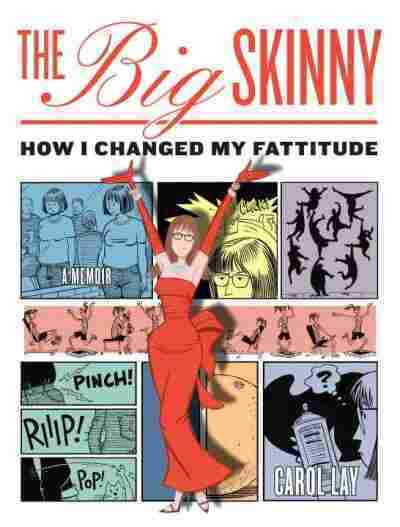 Read A Graphic Excerpt Of 'The Big Skinny'. Diet books are perennials on best-seller lists, and every year a new one seems to capture the public's imagination. But whether the latest fad involves no carbohydrates, low fats, grapefruit, cabbage soup or all beef all the time, the way to lose weight really always boils down to the same thing: Eat less and exercise more. So why do people shell out good money for diet books? 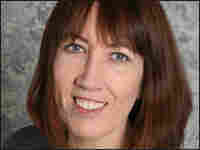 Maria Langer, a freelance writer and commercial helicopter pilot, seems like the kind of person who is nobody's fool. But she admits that over the years she's forked over more than a few dollars on the latest diet book: "I bought in on the Suzanne Somers book, also the Zone books, South Beach Diet books and Atkins Diet books." Now, Langer says she's through with diet books. After buying one of this season's big hits — The Flat Belly Diet — she felt like she had been sucked in with promises too good to be true. "On the cover it tells you 'no crunches' ... So it's telling you [that] you don't have to exercise, and it just kind of lures you in," she says. Edward Ash-Milby, a buyer of health and fitness books for Barnes and Noble, says that diet books thrive on promises of quick, easy results. "The way they attract customers to the book is by having an interesting title and, you know, offering that promise," says Ash-Milby. "How could you not want a flat belly?" Add to that a healthy amount of marketing muscle — often bolstered with a celebrity tie-in or "a platform" for promoting the book — and you have a formula for publishing success, if not weight loss success. "The diet category offers a tremendous amount of repeat business," says Ash-Milby. People "hook into one diet, [and it] doesn't work so well for them ... and they find there is another diet that sounds more interesting." Cartoonist Carol Lay spent her whole life losing — and gaining — weight before she faced the simple truth: She had to change the way she ate. "The first time a trainer put me on a restricted diet plan, I was shocked that I had to eat nonfat, unsugared yogurt. It was like, 'Oh my god, I'd rather drink motor oil,' " she says. Now Lay has her own diet book, The Big Skinny, which uses pictures to tell the story of her — ultimately successful — battle against the bulge. In the end, her path to losing weight — and keeping it off — was simple: "I had to keep track of my calories and make sure I exercised every day," she says. "Because when I get into denial, not wanting to look at the numbers, I tend to slide down that slippery slope that is greased with fat and sugar." 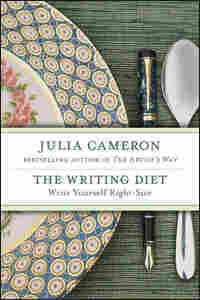 But Julia Cameron, the author of The Artist's Way, believes the key to diet success is in words, not numbers. "For 25 years, as I taught creative unblocking, I had seen that my students would become more lean and more fit as they worked with creativity tools. And so I found myself thinking, 'Oh my God, this is right underneath my nose ... Writing is a weight loss tool," she says. 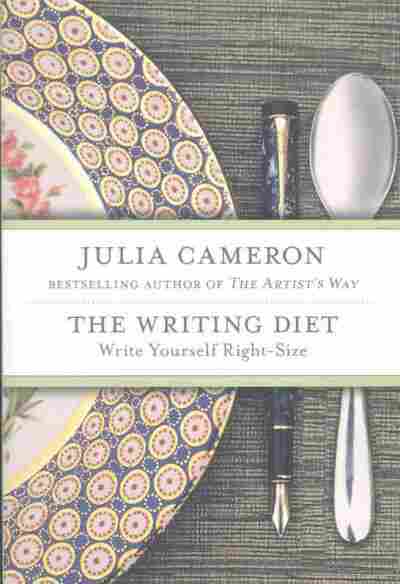 That's right: Cameron says you can write your way to thinness. Her new book, The Writing Diet (read an excerpt), has some standard dieting advice, including a recommendation to walk 20 minutes a day and drink lots of water. But beyond that, Cameron says, you should take time in the morning to write down your thoughts and then keep an eating journal throughout the day. "What I have found is that all these diets work until we stop working them," says Cameron. "When you have a journal and morning pages, you catch yourself as you head into a relapse." When all is said and done, can any book really help the hapless dieter stay on course? Lay says hers can — and you want to believe her, but it's hard not to think, "Oh, all the diet book authors says that." I'm a creativity expert, not a diet expert. So why am I writing a book about weight loss? Because I have accidentally stumbled upon a weight-loss secret that works. For twenty-five years I've taught creative unblocking, a twelve-week process based on my book The Artist's Way. From the front of the classroom I've seen lives transformed — and, to my astonishment, bodies transformed as well. It took me a while to recognize what was going on, but sure enough, students who began the course on the plump side ended up visibly leaner and more fit. What's going on here? I asked myself.Was it my imagination, or was there truly a "before" and an "after"? There was! To my seasoned eye, weight loss is a frequent by-product of creative recovery. Overeating blocks our creativity.The flip side is also true: we can use creativity to block our overeating. That is what we will be doing with this book, using creativity tools to attack our overweight, altering our weight through altering our consciousness. Believe it or not, writing is a weight-loss tool — overlooked, underused, and extremely powerful. It's not as if I've never tried traditional dieting. On the contrary — I'm an amateur expert. Over the years I've tried Atkins, but my cholesterol zooms; South Beach, but I gain back everything the minute I veer away from phase one; the Gray Sheet from Overeaters Anonymous, but deprivation makes me crazy and crazy is what I am trying to avoid as well as fat. I've turned myself in to Weight Watchers, but counting points seems to be its own form of craziness. What I know how to count is words. In building twenty-plus books, I have learned that each word counts, just like each calorie. Suddenly — literally — I have food for thought. What if words can be consumed instead of calories? What if I can write my way right-size? As soon as the idea hits me, I know in my marrow that it is true. Everyone knows that we overeat because something is eating us. What if that question got asked directly, routinely, every time we ate? What if, struck by a Snack Attack, I said to myself,"What's eating me that I have a sudden craving to eat?" What if I took a moment and jotted down my feelings? What if I gave myself food for thought instead of food itself ? Since we can use food to block feelings, why can't we use words to block food? Calories, after all, are units of energy, and so are words. This idea excites me. Long experience as a writer has taught me that writing is a way to metabolize life. If I can write about something, I can handle it — and often with grace. Might writing be a way to metabolize the ebb and flow of my very metabolism? I think it might. I was never thin, nor was I ever fat — not until I had to take a medication that lists weight gain as a possible side effect. The medication is a necessity. The weight gain is, to my doctor's eye, a small price to pay for mental stability. Surely, I think, there must be some way out. Could it be writing? In the twenty-five years I have taught creative unblocking, one of the tools I routinely teach is daily morning writing.How often have I seen my students use their Morning Pages to shed pounds as well as creative inhibitions? Although in an Artist's Way class what we are after is a creative renaissance, a physical renaissance often goes with it, hand in glove. Students often come to me pudgy and depressed. I tell them to write. A steady diet of selfreflection soon regulates their overeating. Pounds begin to drop away. As their Morning Pages work to metabolize their lives, they no longer overeat to block their difficult feelings. Their creativity soars while their weight drops. From the front of the classroom, the transformation is often startling. Laura, a kindergarten teacher, began her creative unblocking, frankly, overweight. 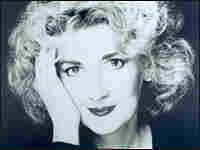 A tall, still-beautiful blonde, she carried an extra forty pounds on her frame. She dressed in slimming black, but the illusion that she was thin was unconvincing. Laura was the kind of woman of whom it was routinely said, "It's a shame she's so heavy. She has such a pretty face." The survivor of a violent childhood home, Laura had learned early to block her feelings with food. Writing her daily Morning Pages, she began to face her turbulent feelings. As she did, the urge to block her emotions with food began to melt away. The pounds prologue melted away too, and Laura emerged from a twelve-week course a far slimmer swan of a woman. She attributes her weight loss to her writing. "There were so many little things bugging me," she recalls. "My Morning Pages were gripe sessions where I saw and worked out my grudges." Once she found out what was eating her, she no longer needed to overeat. Writing makes us conscious. Once we are conscious, it is difficult to act out in unconscious ways. Once we catch on that we are overeating as a blocking device, it becomes harder to reach for food and easier to reach for words. That is what this book teaches you to do. When a Snack Attack hits, you can take yourself to the page instead of to the refrigerator.When you do, your creativity will respond with an increased flow of insights and ideas. "It was right on the tip of my tongue," we often say when an idea eludes us. What we don't realize is that ideas often do live right on the tip of our tongue — and that we drown those ideas when we overeat. Michael, a writer, reports that when he snacks on sweets and starches, his writing dries up, but when he eats a healthful snack like a piece of fruit, the flow of his writing surges forward. Mary Alice, another writer, reports that when she writes down her feelings, she is rewarded by an increased flow of creative power. "It is as though when I name one thing I am given the names for many other things," she says. Our emotions become known to us. Known, they are no longer the saboteurs causing us to overeat. All of us are creative and all of us can be more creative than we are. As we relinquish our blocking devices, we come into our power. In this book we are specifically focusing on food as a blocking device — and on writing as a means to weight control. Although many of my students report that they have found new and exciting lives after following my creativity work, I cannot promise you a new career if you undertake the Writing Diet. What I can promise you is increased clarity, increased energy, increased productivity. As you write, you will lose weight and gain creativity. As you unblock your feelings, you will gain access to the energy that they hold. As you become more familiar with yourself, the origin of your creative work, you will become, quite literally, more original. As you become more lean, your thinking will grow more clear. As you lose weight, you will stop waiting for the magic wand that will transform your life. Instead, you will realize that the magic wand is actually a pen and that, pen in hand, you can transform your own life. Unlike most diet books that proclaim that they alone have the answer, the Writing Diet works successfully with any sensible eating plan. Writing is the key. You can write on Atkins. You can write on South Beach. You can write on Weight Watchers and Overeaters Anonymous. In fact, using the tools of the Writing Diet will greatly increase your chances of success with whatever diet you choose. If you are drawn to this book, odds are good that you feel you are both creative and creatively stifled. You literally hunger for a more satisfying life.Working with the tools of the Writing Diet can give you that life. Your sweet tooth will be satisfied by the sweet satisfaction of a richer and more fulfilling life. For simplicity's sake, this book is divided into two parts. Part One introduces you to seven simple tools. They are the bedrock of your recovery from overeating. Part Two features essays on the many situations and circumstances you may find yourself facing. Each of these essays is paired with a further tool that will deepen your consciousness and creativity. Quoted with permission, from The Writing Diet (c) 2007, 2008 by Julia Cameron, published by Tarcher/Penguin.